Audra McDonald As Billie Holiday: The Importance Of Feeling It The freshly Tony-nominated actress and her frequent collaborator, director Lonny Price, talk about the unconventional structure and dramatic challenges of Lady Day at Emerson's Bar and Grill. 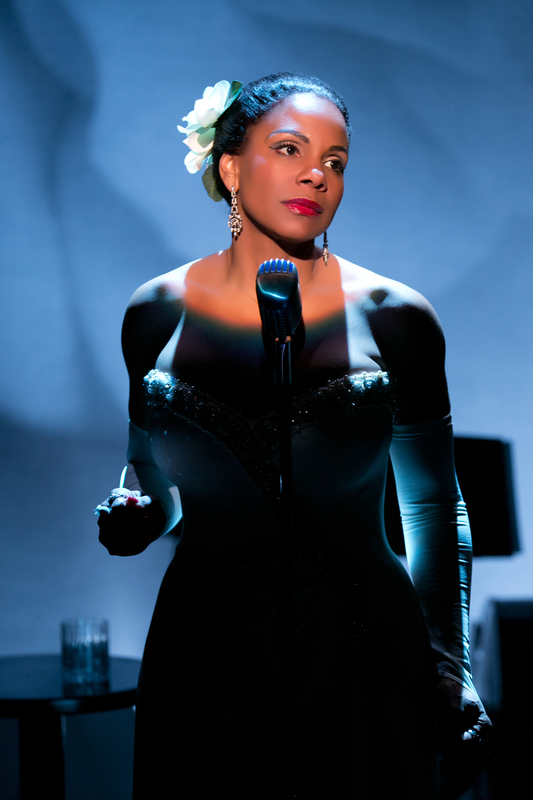 Audra McDonald just nabbed a Tony nominations for playing Billie Holiday in Lady Day At Emerson's Bar And Grill. Billie Holiday will not be singing unless she "feels it." That's practically her thesis statement in Lady Day at Emerson's Bar and Grill, Lanie Robertson's play about a drug-ravaged nightclub show near the end of Holiday's tortured life. War stories and bawdy jokes are never a problem — and neither is pouring a drink — but if the audience wants a show, they have to wait until Lady Day can give them something real. Take away the booze and drugs, and you find a similar spirit in the show's current Broadway production, appearing through August at Circle in the Square Theatre. Star Audra McDonald, who just this morning got a Tony nomination for her performance, has been widely praised for accurately imitating Holiday's singing voice, but she and her director Lonny Price are just as committed to emotional authenticity. "Not unlike Billie, I think Audra is incapable of falsity," says Price, who has directed McDonald in several productions, including a 2007 Broadway revival of 110 in the Shade and this spring's New York Philharmonic staging of Sweeney Todd. "She won't settle, and if it's not truthful to her, she won't play it. I know she pushes me harder than other actors do, and I may push her harder than other directors do." McDonald agrees, and she feels her longstanding friendship with Price allows them to cut past formalities and get right to improving the work. "We know each other's tricks," she says. "He knows when I'm being lazy about something and saying, 'Well, I don't feel like working on this today.' And if I feel that he's going for something that feels too general, or if I'm not getting the specific note I need, I will push him until he gives me an answer we both agree on." That dynamic is especially useful in Lady Day. Though Robertson provides a structure for Holiday's gig at the titular Philly dive — she tells increasingly revealing stories as she ingests increasingly harmful substances — he leaves the creative team plenty of interpretive room. "When you read the play in script form, it's one long paragraph with songs," McDonald says, meaning there aren't a lot of stage directions to suggest how scenes should be played. Plus, the show's 13 numbers — including "God Bless the Child" and "Strange Fruit" — are classics from Holiday's repertoire, not musical theater tunes. "That's really the biggest challenge of the piece," Price says. "In a show where songs don't reveal character and certainly don't move the plot, it's about getting that character to a place where those songs feel inevitable." In other words, Price and McDonald have to clarify why Billie is "feeling" each number before she sings it, or nobody is going to be satisfied. "We did that so she can get excited to be in the audience," Price explains. "She feels good to be around people who like her, and being in the middle of them, she thinks, 'Let's have a party! Let's sing 'Pig Foot'! Now, she could sing 'Pig Foot' from the stage, and maybe there'd be another way to get her there. But her being around those people creates a party atmosphere that's believable for a silly, celebratory song." That's not the only time Holiday draws on her fans. She constantly talks and flirts with them to find inspiration for the next moment. "My biggest partner every night is the audience," McDonald says. "That's who she's afraid of. That's who she's wanting love from." As a performer, it requires an enormous amount of faith to interact with the audience during a scripted show. There's no guarantee they'll respond in a certain way, but marks still have to be hit and songs still have to be sung. McDonald must stay responsive and alert, finding reactions that will both acknowledge what the audience is doing and create a truthful transition to the next scene. "This is not a show that lets me drift away mentally, because I never have any idea what I'm going to get," she explains. "As Lonny says, it's like the audience is my co-star and there's a new understudy on in the part every night. But that's why I've leaned on him to make sure I know what my 'verb' is for every single beat of this. What does she want? Why is she doing this?" And besides, interacting with the crowd adds even more authenticity to her performance as a nightclub singer in a bar and grill. "We accept any and all reactions in this show," McDonald says. "Because that's real life. That certainly would have been real life for Billie Holiday in this particular moment. Mark Blankenship edits TDF Stages and tweets as @IAmBlankenship.